Based on the seminal publication Comprehensive Internationalization: From Concept to Action by John K. Hudzik, this new digital download examines the lessons learned and future prospects for comprehensive and strategic internationalization. 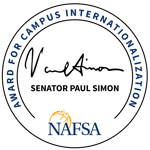 This publication by John K. Hudzik frames NAFSA’s work in comprehensive internationalization. This publication by John K. Hudzik and JoAnn S. McCarthy presents a flexible leadership framework for the what, why, and how of both strategy and action for comprehensive internationalization. More than a decade of award-winning campuses offer examples of various approaches in a variety of institutional types. Being selected for an award can put your campus in the spotlight. Developed and maintained by senior international education leaders, this professional network provides resources and professional development advice on a full range of topics, from management and leadership to partnerships to assessment and evaluation. 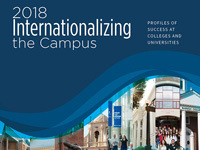 The publication aims to provide a definition and rationale for the term global learning, as well as related student learning outcomes in an effort to help campus practitioners work together more effectively. Additionally, it discusses designing educational experiences through which students gain competence and meet those outcomes and the importance of demonstrating how experiences help students become global learners. It follows a 3-D (defining, designing, and demonstrating) approach, and briefly describes the multidimensional maps that could emerge at colleges and universities for global learning. Zeroing in on institutional performance and the outcomes of student learning are two complementary and crucial frameworks for evaluating the results of internationalization, writes author Madeleine F. Green. Looking in detail at three varied institutions’ efforts to improve and assess global learning, Madeleine Green draws out the common threads that characterize model practice. The three case studies from Florida International University, Georgia Institute of Technologies and Juniata College are included, giving a comparison of their approaches to framing outcomes and using these for ongoing improvement. Advising the association are international education leaders focused on the topic of internationalization. Learn more about the fellows and their contributions.